In 1923, the New York Times and Time Magazine reported that King Alfonso of Spain summoned a famous New York osteopath to treat his fifteen-year-old son, Infante Don Jaime (1908-1975). Deaf and mute following a severe case of mastoiditis (middle-ear infection) and possibly tuberculosis at a young age, Don Jaime was adjudged “incurable” by Spanish specialists, though many attempted to restore the young don’s hearing. One specialist performed a difficult surgery that reports suggested made his hearing worse. Dr. May of London also performed a surgery, though with only temporary results. Another recommended the child be sent to a sanitarium of a celebrated physician in Switzerland, but no improvement was gained. For most of his life, don Jamie was tutored and cared for by Valencian nurses whose mission was devoted to educating the deaf. Now, the osteopath, Dr. Curtis H. Muncie (1887-1963) of Brooklyn, was sailing on the Majestic for Europe. Upon his return, Muncie sent out public notices announcing he had successfully cured a “Prince” who was so deaf he could only hear shouted conversations. Placing Don Jaime under anaesthetic, Muncie performed his famous specialized and bloodless surgical maneuver; within twenty minutes, Don Jaime was able to hear completely and normally. As reports of Muncie’s miraculous surgery made headlines, the Spanish court sent out a cablegram to the Spanish Ambassador in Washington, D.C., demanding a correction of notices regarding Don Jaime’s treatment. No physician, Muncie or another, had cured the young prince. Under attack, Muncie defended himself by stating he never gave a prince’s name in his original publicity releases. Rather, it was another European prince he had treated, and whose name he was bound by confidentiality to release. In 1942, the Journal of the Medical Association editorialized “Muncie may well rank among the leading charlatans of our time.” Indeed, from 1910 to 1960, Muncie was reputed to manage the world’s largest otology practice, operating out of the entire 29th floor of the Hotel Delmonico in Manhattan, overlooking Central Park. His practice was so successful that over the course of his career he treated upwards of 1,585,000 cases, drew in an income of $500,000 during the height of the Great Depression, and even had his hands insured for $400,000! All due to his “Muncie Method of Constructive Finger Surgery,” a manoeuver in which he used only his fingers to manually manipulate the ear canal and Eustachian tube to correct deafness. Curtis H. Muncie was born in 1887 in Brooklyn, New York, to Edward H. Muncie and Elizabeth (Libbie) H. Muncie, both M.Ds. Edward Muncie had established the first homeopathic dispensary in Brooklyn as well as the Muncie Sanatorium of Brooklyn in 1896 and the Muncie Surf Sanitarium on Muncie Island (near Long Island) around 1897. Elizabeth also had an impressive medical background: after obtaining her M.D. from the New York Medical College and Hospital for Women in 1891, she specialized in gynecology and surgery, enrolling in the Chicago Homeopathic Medical College from 1892-1895 to study orificial surgery. After, she studied surgery at John Hopkins Hospital before establishing the Sanitarium with Edward to surgically treat chronic diseases. Elizabeth Muncie also wrote a book on eugenics and parenthood in 1910, titled Four Epochs of Life. At his parents’ private practice, Muncie observed the principles of osteopathy: the process of physically manipulating the body’s bones, tissues, and muscles, with limited use of instruments. He then studied at the Philadelphia College and Infirmary and later the Kirksville College of Osteopathy and Surgery, receiving a degree in 1939. From 1910 to 1912, Muncie practiced general osteopathy in Brooklyn, before deciding to specialize in ear diseases, operating out of an office at the Muncie Sanitarium. According to Muncie, his decision to specialize was conceived in 1910 when he was referred a patient, a 11-year-old boy, for a simple adenoid operation. As the story goes, after removing the adenoids, Muncie inserted a finger up the boy’s nasopharynx to ensure there were no complications from the operation, when his finger accidentally slipped and placed pressure in the Eustachian tube. When the boy came out of the anesthetic, he could hear perfectly. Two weeks later, the boy’s mother brought him back to Muncie, as the deafness had returned. Muncie repeated the finger manipulation and the boy could hear again, this time permanently. 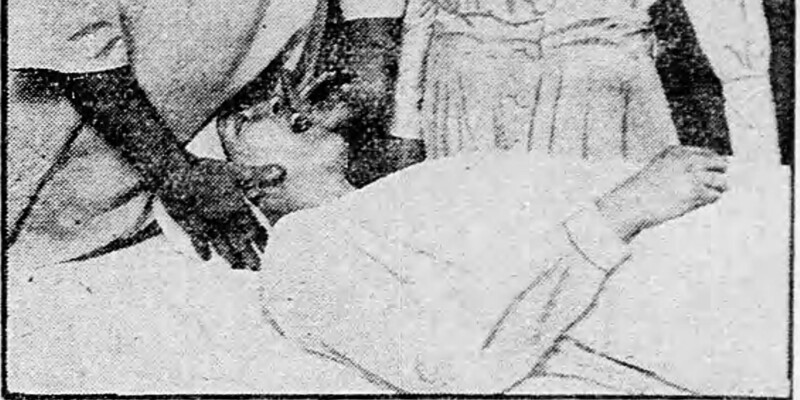 Muncie demonstrating his surgery, 1923. For Muncie, his accidental discovery challenged previously observed anatomical findings that the Eustachian tube is no bigger than a goose quill. To perfect his method, Muncie digitally examined the Eustachian tubes of over 500 patients during 1910-1916, correlating his findings in 1921 to announce two major claims. The first, that the Eustachian tube is different in size, contour, and tone in deaf persons. The second, that there is a type of deformity that is characteristic of certain types of hearing loss; he isolated 8 types of deformity that required a specific finger technique to correct it. Muncie demonstrating his method, 1926. Word of Muncie’s success soon became widespread. His claim that all types of hearing loss can be traced to deformities of the Eustachian tube resonated hope to people believing they had incurable deafness. Anecdotal tales of patient success attracted popular periodicals, including Time Magazine, McClure’s Magazine, and the Sunday Daily Mirror. Muncie was invited to nearly 30 major U.S. cities, to London, Paris, Glasgow, and Honolulu to demonstrate his technique. Of course, he refused to teach others his method, claiming only he possessed the unique skill and finger dexterity necessary for the procedure—clear indication of Muncie’s brilliant ability to manipulate the popular press and retain his exclusivity. By 1926, he performed over 25,000 of the treatment, though it’s unclear what his criteria was for patient selection; by 1929, his practice grew to such an extent he relocated his offices from the Muncie Sanitarium to Hotel Delmonico. On July 17, 1930, Muncie made the New York society pages for marrying his assistant, Mrs. Ada B. Hicks. The couple would later have two children, Douglas and Louise. Nine years after marriage, Muncie was arrested and indicted for failing to pay federal income tax; three years later he pled guilty and was sentenced to a year in jail and ordered to pay a settlement of $100,000. When Muncie was released from prison in 1942, his son had completed his degree in osteopathy and was taking up his father’s footsteps, even learning the Muncie Method despite claims it couldn’t be taught. Ravi S. Swarmy and Robert K. Jackler, “The Fickle Finger of Quackery in Otology: The Saga of Curtis H. Muncie, Osteopath.” Otology & Neurtology 31 (2010): 846-855. Can Vitamin B Cure Deafness?